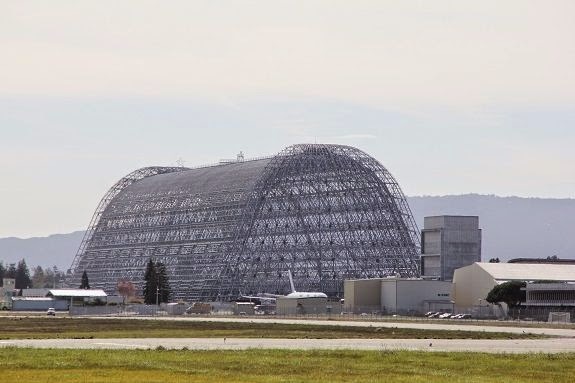 MOFFETT FIELD, California -- NASA announced on Monday that the agency has signed a lease with Google's subsidiary Planetary Ventures, LLC to manage Moffett Federal Airfield (MFA), an agency facility located in Moffett Field, California, and rehabilitate its historic Hangar One. NASA estimates the lease will save the agency approximately $6.3 million annually in maintenance and operation costs and provide $1.16 billion in rent over the initial 60-year lease term. MFA, currently maintained by NASA’s Ames Research Center in Moffett Field, California, includes approximately 1,000 acres of land located on South San Francisco Bay. The land includes Hangars One, Two and Three, an airfield flight operations building, two runways and a private golf course. -- Creating an educational facility where the public can explore the site’s legacy and the role of technology in the history of Silicon Valley. Planetary Ventures will assume operation of the site following the finalization of a joint plan with NASA, the federal Environmental Protection Agency and California Regional Water Quality Control Board to ensure continued environmental stewardship and protection of the existing remedies of the site. As a tenant to NASA, Planetary Ventures will be required to comply with all applicable laws, regulations and policies, including those on topics of historic preservation, environmental compliance, security, health and safety, and airfield operations to support ongoing missions and other government objectives. “We look forward to rolling up our sleeves to restore the remarkable landmark Hangar One, which for years has been considered one of the most endangered historic sites in the United States,” said David Radcliffe, Vice President of Real Estate and Workplace Services at Google Inc.
Once renovations are complete, Hangar One is expected to once again be home to high-tech innovation as Planetary Ventures begins using the historic facility for research, development, assembly and testing in the areas of space exploration, aviation, rover/robotics and other emerging technologies. Hangars Two and Three will be used for similar purposes.